Today (May 22nd) is the Feast Day of the glorious saint, St. Rita of Cascia - known as "The Saint of the Impossible". 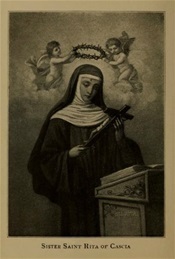 In honor of her feast we are posting a wonderful book about her heroic life titled, "Life of Sister St. Rita of Cascia of the Order of St. Augustine Advocate of the Impossible; Model of Maidens, Wives, Mothers, Widows and Nuns", translated by Fr. Dan J. Murphy O.S.A. from the Spanish of Fr. Joseph Sicardo O.S.A. Imprimatur, 1916. Santa Rita, Ora Pro Nobis! Today (May 22nd) is the Feast Day of the glorious saint, St. Rita of Cascia - known as "The Saint of the Impossible".